We leave Port Hacking at 7:00 am and return at 12:00. On some occasions we may also do an afternoon event, leaving port at 12.30 pm and return 17.30 pm. We accept group bookings but also individual reservations and make up suitable teams as required. Of course, if you arrange a team, we can make adjustments as necessary to all schedules. All @ Sea Charters is operating with a minimum of six and maximum of eight guests for off-shore fishing or cruising events. 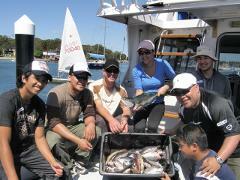 For inshore events we can accommodate fourteen guests. You will be heading out into the ocean in a 34’ Seatamer sport-fishing flybridge cruiser. These boats are believed by many professional fishermen to be among the best for this kind of fishing adventure. Crew will begin by introducing you to the vessel and equipment and will give you a rundown of safety procedures. 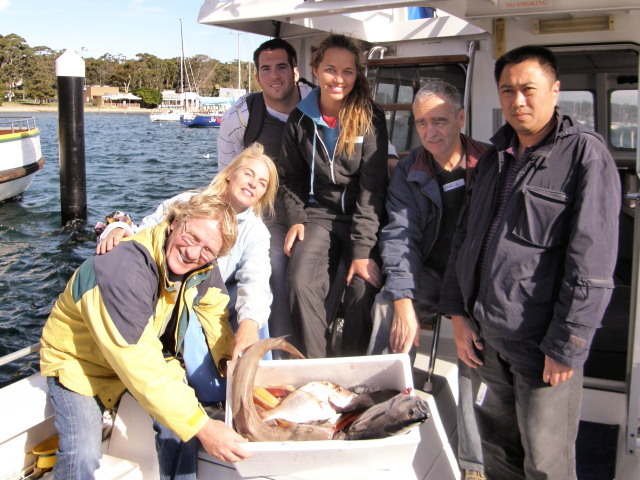 The boat is equipped with all the required safety equipment and is compliant with NSW Maritime safety standards. The boat is also equipped with a galley, coffee facilities, fridge and freezer, hot and cold running water, CD or DVD and comfortable seats. A shower and toilet are located in the front cabin.